If you follow us on social media, then you probably know that we just celebrated our 20th anniversary. 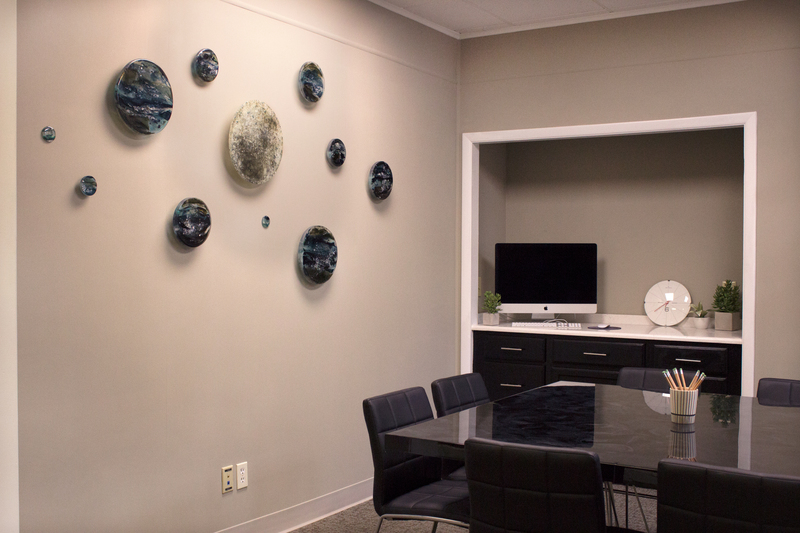 To mark this amazing milestone, we commissioned an equally amazing glass art installation by Carmella Jarvi, a local Charlotte artist. As fans of great design and unique art, we loved getting an inside look at Carmella’s creative process, and we thought you might appreciate it too. So today’s post is a creative journal of sorts with lots of cool photos from Carmella’s five-month-long commission. Even though we’re in the business of design, our office had relatively few pieces of artwork (aside from the client work that we have on display). 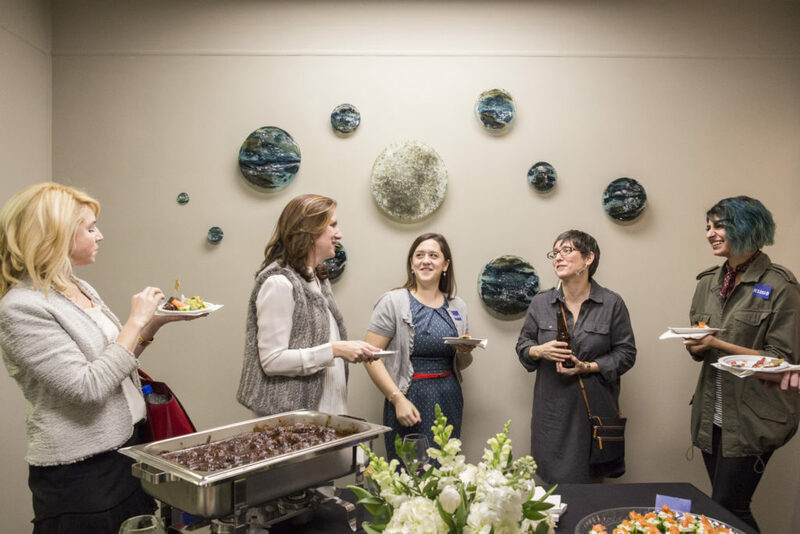 We knew that adding artwork would help create a more inspiring space – and what better excuse to commission a custom piece than our 20th anniversary party? We discussed creating something unique, inspired by the awe-inspiring beauty of the moon and outer space, in keeping with our brand and the theme of our office. 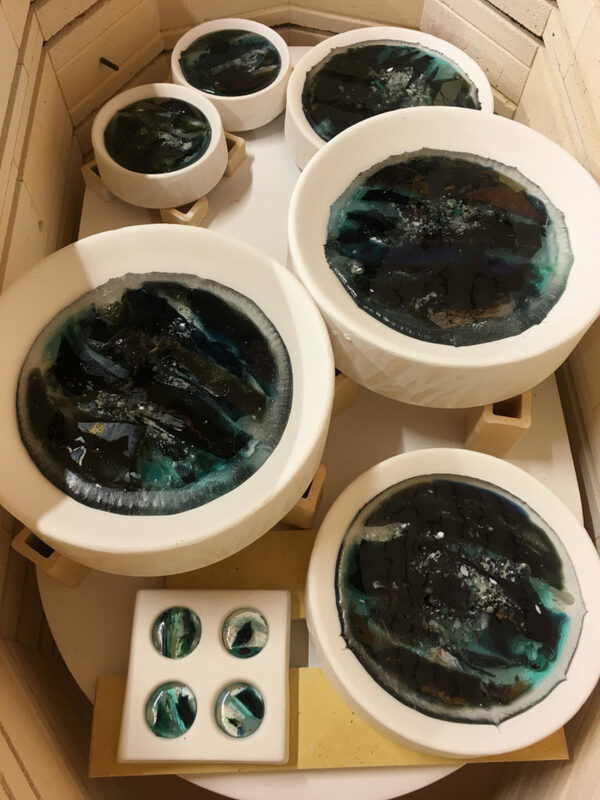 Carmella was a natural partner for the project – Dawn has been an admirer of her work for many years, and even invested in Carmella’s crowd-funded dream kiln when she started working with glass a few years ago. 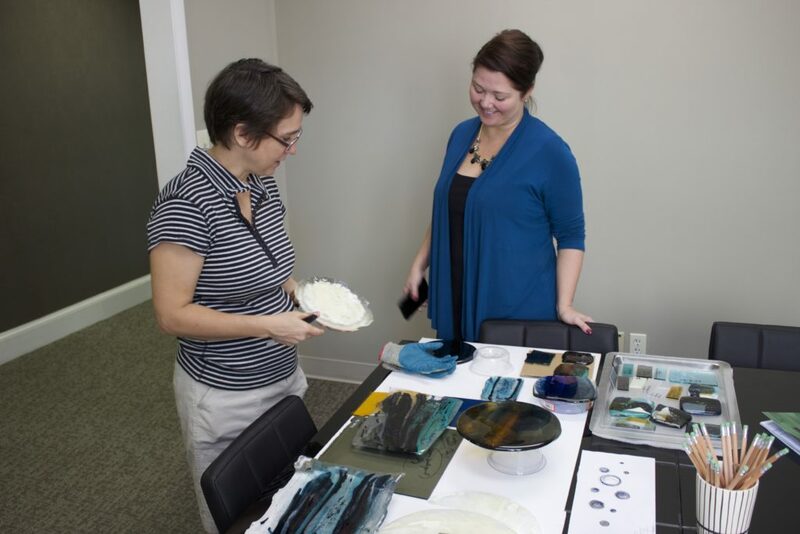 Dawn and our interior designer, Mary Jo, commissioned the artwork after visiting Carmella’s studio last summer. To kickoff the project, Carmella visited our office to show us some similar work she had created before, talk through our goals for the project, and view the conference room where the installation would live. She took one of our business cards with her to use as a reminder of our brand as she thought more about what our artwork would look like. 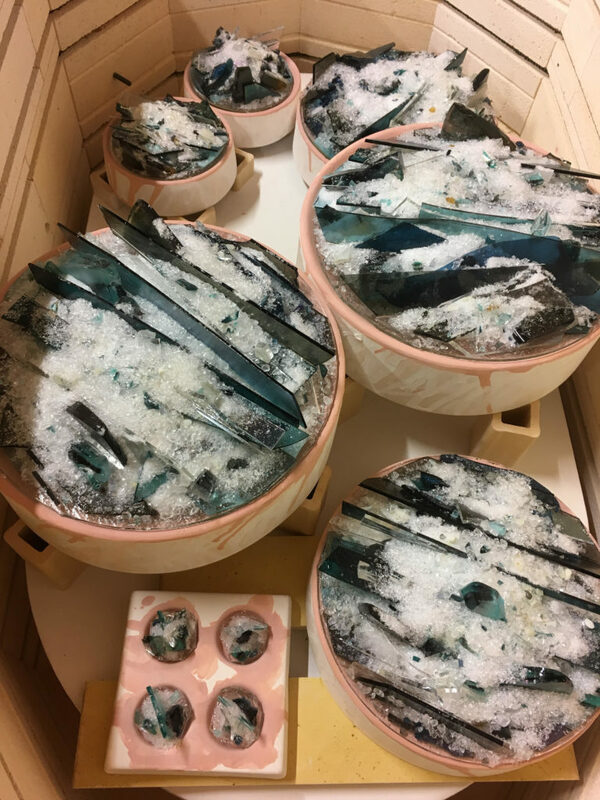 With our goals in mind, Carmella ordered the glass from Bullseye Glass, her favorite glass company in Portland, Oregon that makes beautiful, high-quality glass. 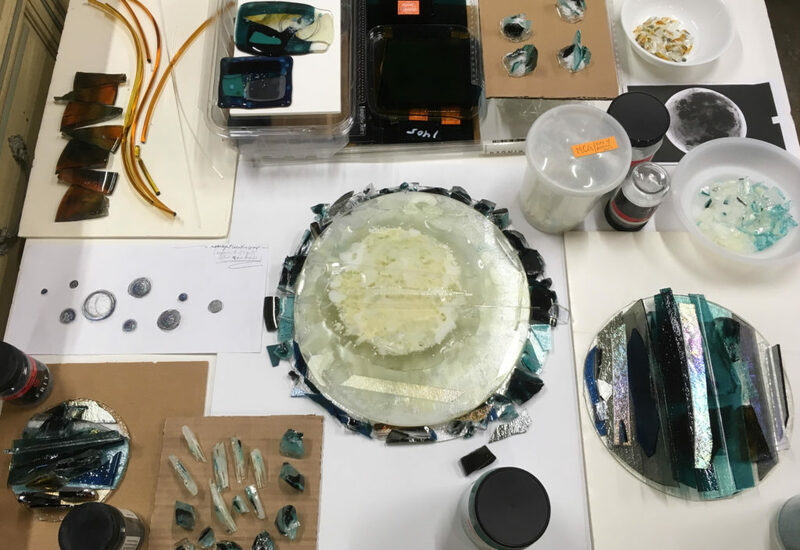 She ordered a mixture of types and colors – opaque, translucent and iridescent, as well as sheets, frits and rods – to combine with one another, mimicking the movement of the sky and stars. 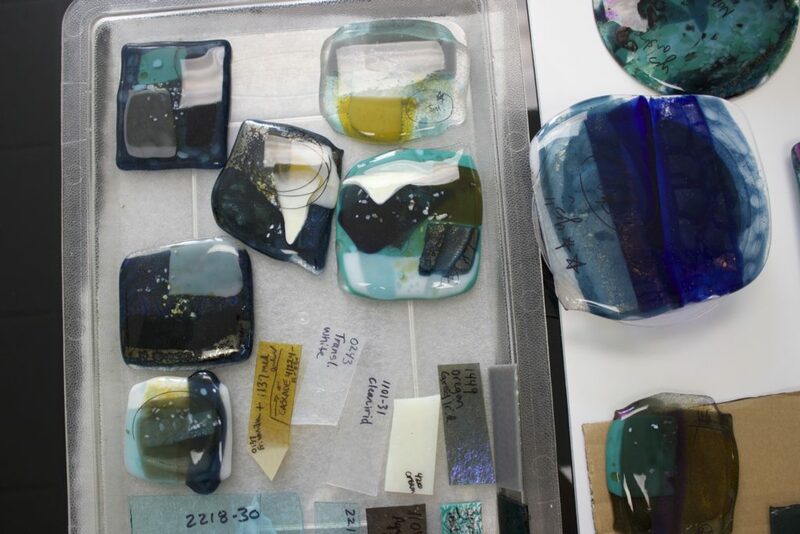 Carmella used some of the glass to create a few smaller test pieces, taking notes about how she layered the glass on these sample pieces to revisit later once she learned what we did and didn’t like. 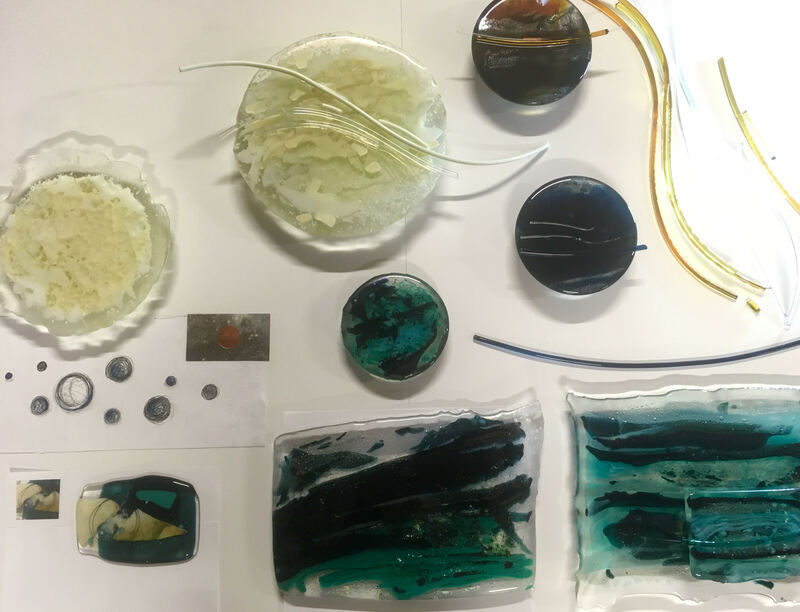 At the same time, Carmella created sketches of what she envisioned for the installation and brought these and the glass samples to our office to test the colors in our conference room. Dawn, Mary Jo and Carmella discussed each sample and circled the parts of each that they liked best, while also noting the parts that they didn’t like and why. For example, they liked the teal accents and iridescent glass, but didn’t like too much of the amber color. 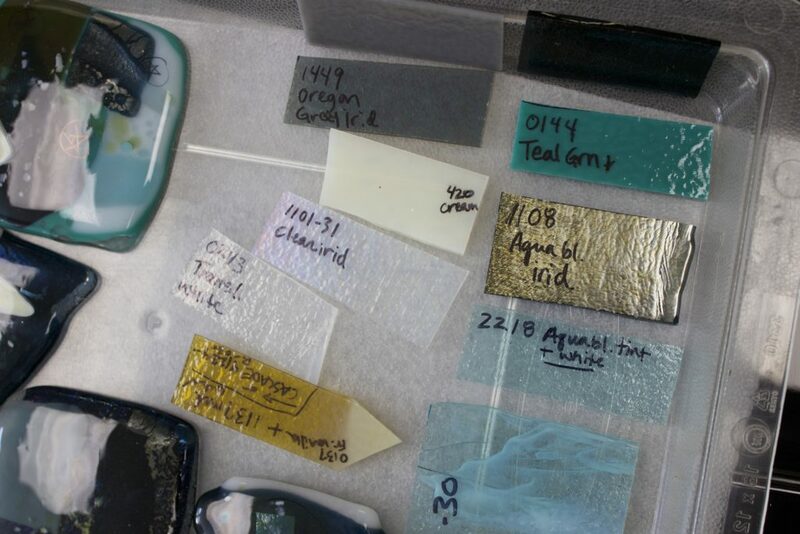 Carmella also took notes about their preferences on the back of each of the glass samples – these notes helped her remember their feedback when she returned to her studio to create the real deal. Armed with feedback and preferences, Carmella spent first few weeks in her studio working her magic. 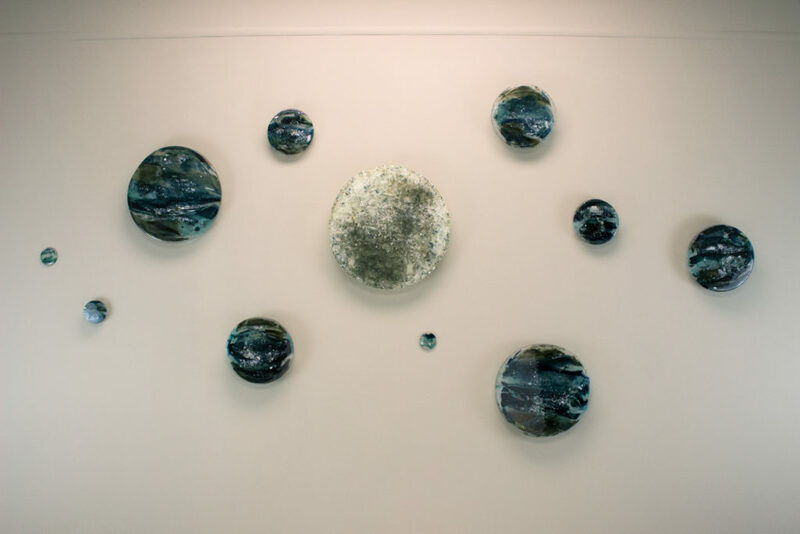 First, she created the “stock glass,” which she recombined with more glass to create the different pieces and the moon, by placing the layers of unfired, factory glass inside of different-sized casting bowls to get the different sizes and shapes she wanted. She even smashed some of the test samples with a hammer to give each piece elements of (slightly controlled) randomness. 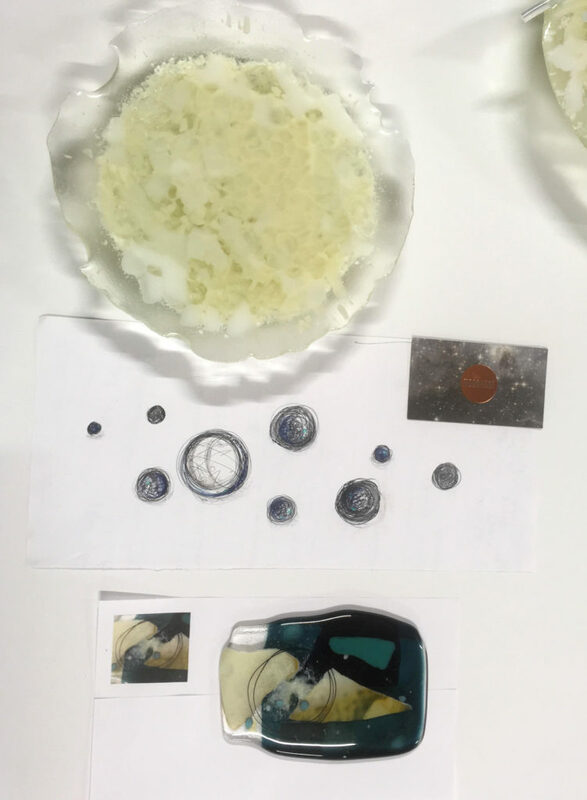 Then, Carmella fired the glass rounds multiple times, modifying, if necessary, to make sure that there was good movement and color variation in all of the different pieces. 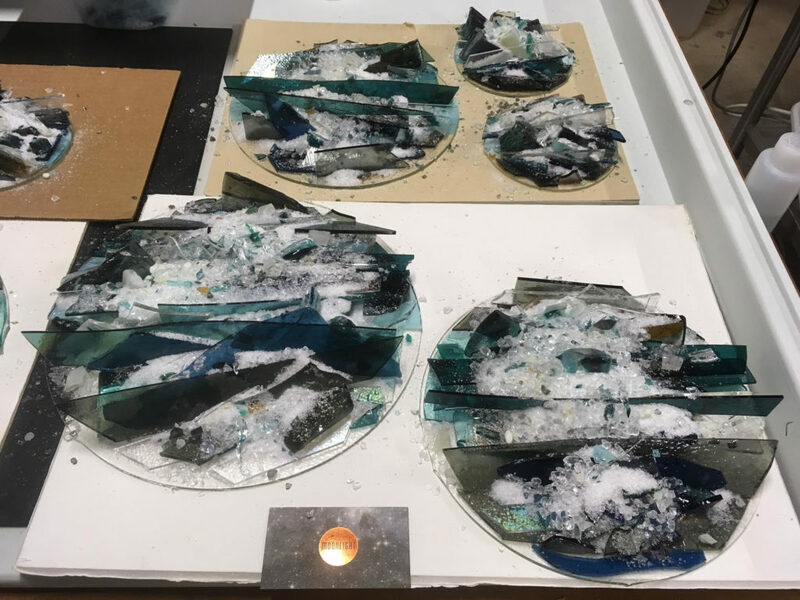 She ran into one snafu: the moon cracked (RIP), likely due to a combination of its large size, the less-stretchy opaque glass and a cold spell in Charlotte. But never fear! Carmella quickly remade a new moon, and we think it looks even more fantastic than the original. Finally, it was time to install the artwork, just in time for our 20th anniversary party! Carmella created a template for the 4’ x 7’ installation on large photo backdrop paper. She glued the specialty mounting hardware on the back of each glass piece to be placed on wall-mounted hooks, and spent the better part of a morning hanging all of the pieces in all the right places on the wall in our conference room. Check out the final installation! It definitely takes our conference room to new heights. ☺ Thanks, Carmella! Want to see move of Carmella’s glass artwork? Check out her website at carmellajarvi.com! You can also get in touch with her directly at carmella@carmellajarvi.com or 980-253-9170.